The vendor list shows all vendors by default but the user can set filters and layouts to customize the view as they require. To add a vendor, click the + (add) button and to edit an existing vendor click the vendor in the vendor list and click the edit icon. Status – Active or Inactive. Inactive hides the vendor from display unless the user has ‘Show inactive Vendors’ set on in User Settings/vendors. Remit to – The name and address that will print on checks if Remit to exists. To add a ‘Remit to’ click the + at that the bottom of the list. Leave the address code blank and tab off. It will automatically add the ‘Remit to’ code and then user can enter the name and address. An exempt tax number can be added if this tax is not paid to the vendor. In Canada Tax 2 exempt number from Company settings/General/Tax Info will be added automatically when creating a new vendor. Remove this number if the tax is to be paid. Shipping method – Shipping method that gets added to purchase orders by default for this vendor. Expense – The GL account that AP invoices get posted to by default. Any number of communications or notes can be added to a vendor. The example above shows how you can add a note that is set as an alert. 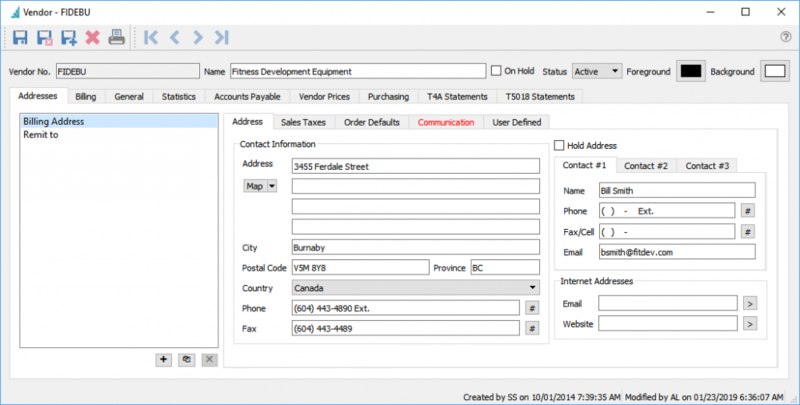 When the vendor is added to a purchase order the message “PO Minimum $5,000” will pop up. Any number of attachments can be added to a vendor. The user browses for the file to attach to the record and gives it a subject and saves it. Then by double clicking it the attachment will open in the computers default program for that type of file. 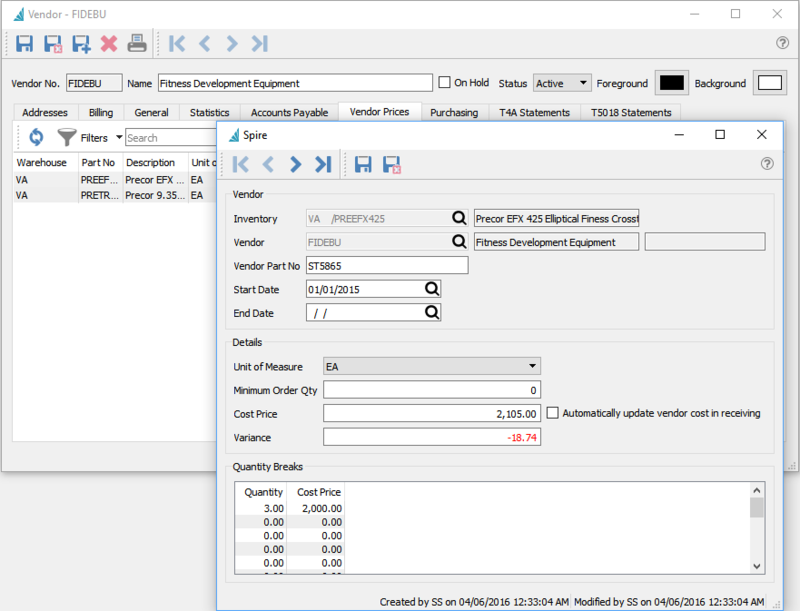 If a UDF license for Spire is owned, fields can be added of various types to track extra information about this vendor that can also be added to custom reports and forms. 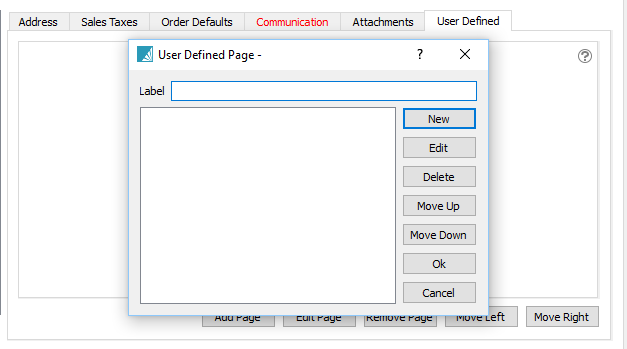 See User Defined Fields section for more info on setting up and using UDFs. 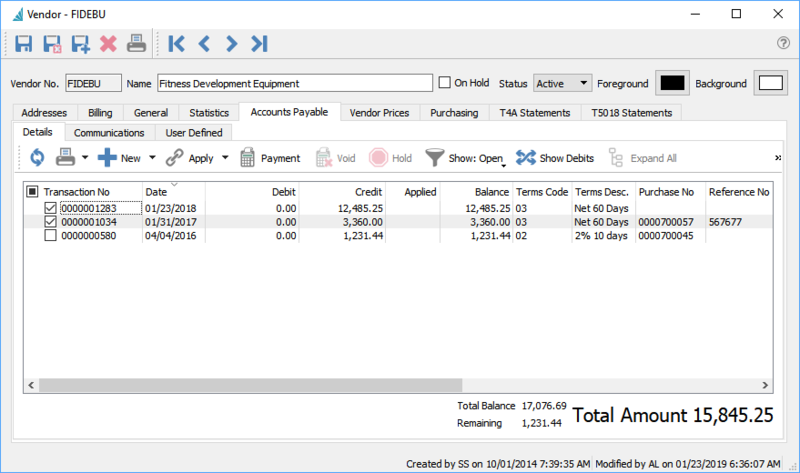 Accounts Payable – The GL payables account that will be used to post for this vendor. Once posted to this account cannot be edited. Payment – The GL account that will be used when paying this vendor. Can be changed when payment is made. Print Checks – Select if cheques are printed for this vendor. When a payment is issued in accounts payable they the next available check number will be presented. If they are paid by another means leave it un-checked. Use Remit To – Select if the check is sent to a different name or address. 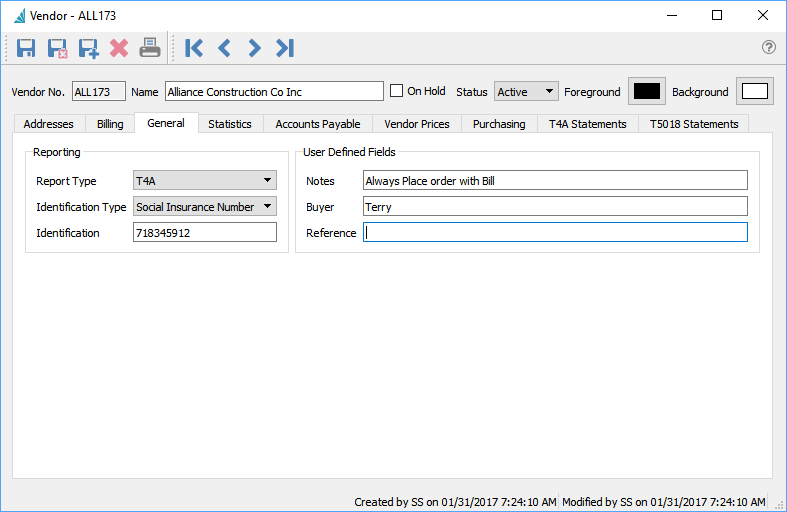 Use billing address taxes on purchase order – If this is checked then the taxes on a PO will default to the vendor taxes. If unchecked the taxes will default to the warehouse tax settings. Account No – The companies account number with this supplier. Currency – What currency this vendor bill in. Once posted to the currency cannot be changed, The code show blank if the currency is in base. Bank Information – The institution, transit and account number for the vendor for paying by EFT. See this link for EFT payments. Notes – A note that will appear on the PO in yellow. Use this for one important note about the vendor. Start Date – Date to start this price. Note that overlapping dates cannot exist. Minimum Order Qty – Minimum quantity the vendor will allow this item to me purchased in. When the item is added to a purchase order this amount will be added to at minimum. Variance – Difference between this cost and the items current cost. Automatically update vendor cost in receiving – When the PO is received and the cost is different than this record, this cost will be updated. Quantity breaks – Breaks in prices can be added for various quantities. 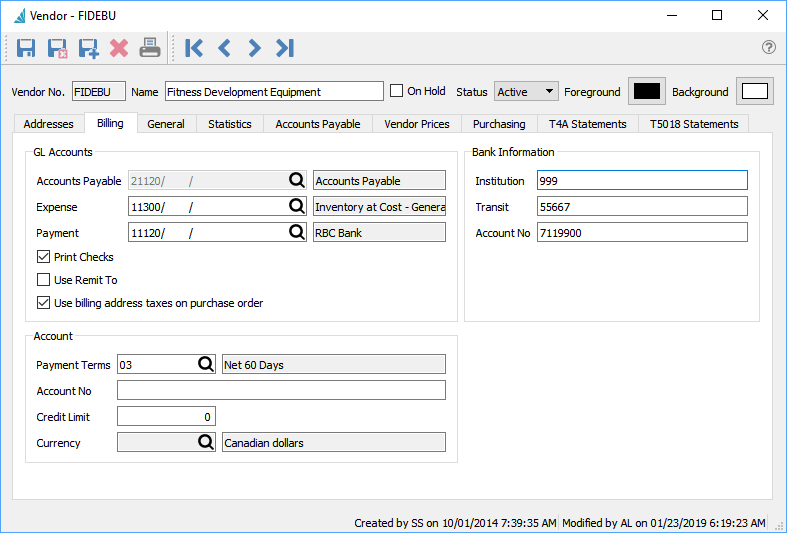 Purchase Orders can be added/edited for this vendor just like they can be in the Purchase Order Module. All of the closed purchase orders for this vendor show up in this tab. The user can sort, search, filter and export POs from this screen. They can also drill down into the PO and see the details. While viewing a PO they can copy or credit it.